And so we arrive at what is, at this moment in time, Fuzzball & Scuzzball episode 200. A few years ago, when I reached #200, I wrote and drew this comic. It was extra long and featured all the supporting cast. But when I started the strip over, I cut a bunch of strips, and it changed the numbering, and my episode 200 extravaganza ended up being episode 183. So I wasn't sure what to do when I reached 200 the second time, until I realized that Valentine's Day was coming up, and then my course was clear. *Fuzzball and Scuzzball have no arms or legs, so it's hard to show them moving, but D.F. does an admirable job showing them move down the hall in the first panel. *Most of the panels have detailed backgrounds, which makes the minimalist background in panel 3 all the more effective. *Look at all the distinct items Scuzzball's throwing into his suitcase in panel 4. *In the background of panel 4, you get a rare glimpse of Momball and Dadball. 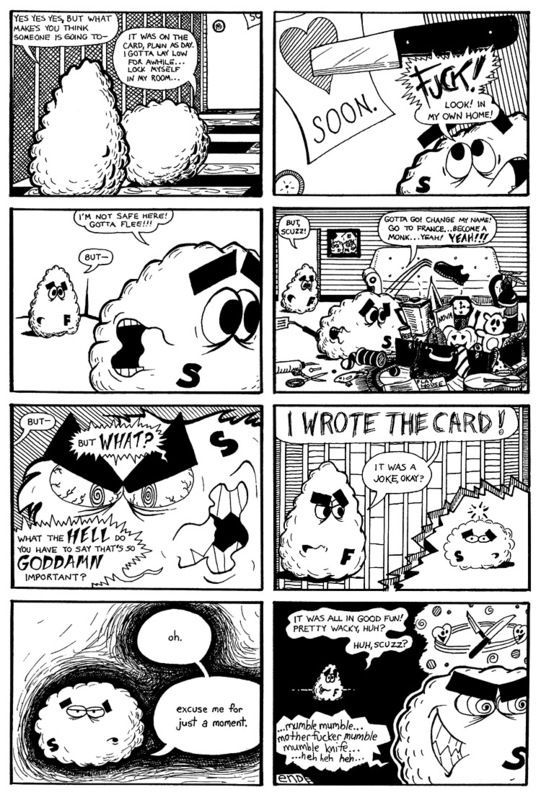 *Notice how the abstract backgrounds in panels 6 and 7 convey Scuzzball's emotional state. It's a beautiful piece of work, and I'll always be grateful to D.F. French for all the time and care he put into it.